Create a luxurious and inviting look throughout every room of your home when you install vinyl sheet flooring from our store. Whether you are looking for the classic look of wood or a modern set of tiles, you'll find stunning collections of vinyl flooring in our showroom. Our team of sales and installation experts is available to help you find the perfect flooring option. When you visit our showroom, you'll enjoy access to a wide variety of materials, colors, and styles. We are happy to guide you every step of the way—from selection to installation. Rely on our help to transform your space with one of our stylish and durable product options. Upgrading your home is easier than ever before with the vinyl sheet flooring from our showroom. This innovative product allows homeowners to transform any space without the need for lengthy construction. Our stock includes patterns from the top brands on the market. These sheets offer the luxury look of slate, marble, and other high-end materials without sacrificing on durability. With all of the design options to choose from, you are sure to find the perfect style to match your décor from our collection. We are happy to help you choose the right color and texture to fit any home. Your floors go through a lot during any given day. From spills to scuffs, there are a number of things that can cause damage. Choosing low-maintenance flooring is an easy and effective way to invest in your residence. 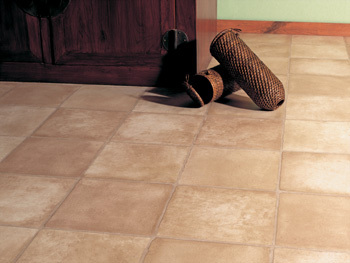 Vinyl tile flooring is one of the most popular materials on the market due to its durability. When properly installed, this material is resistant to dents and scratches, and can last up to 20 years. It is also one of the most durable options available, making it the perfect selection for families living with children and pets. Clear Top Layer: This gives the flooring a glossy appearance. Wear Layer: This gives the flooring durability and the ability to withstand years of wear and tear. High Resolution Printed Layer: This gives the flooring an authentic appearance and is printed to mimic the look of all types of stone and tile. Core Layer: This gives the flooring the comfort and forgiveness you need underfoot. Backing: This gives it strength and makes it impervious to water damage and pulling away from the subfloor. Nothing delivers a classic and luxury look as well as hardwood does. If you are looking for the classic look of wood without the cost or maintenance, vinyl plank flooring may be the perfect solution for your space. Our showroom features a full selection of planks that deliver five-star style to your kitchen, den, or office. Stop in and visit us to see our wide collection of stunning designs to upgrade any space. Vinyl planks add natural warmth to living spaces of any size with the same durability you've come to expect from vinyl tiles and sheets. Our quality vinyl plank flooring is available in a full range of designs, with each guaranteed to make an eye-catching addition to any room. We carry styles in our showroom that mimic all major types of wood flooring, including oak, maple, and birch. There are printed styles that come with details that look just like real wood. If you want deep stain patterns, knots with the look of imperfections, and even coloration changes, there is a style for you. Once you have decided on the perfect materials and styles for your space, make sure the installation is completed correctly. Our crews are available to perform a full vinyl flooring installation in any room at your home. We take care of each of the details, allowing you to focus on enjoying and decorating your new space. Many homeowners believe that they can complete the installation process on their own. This can result in mismeasurements, broken tiles and planks, and a less than quality result. One of the advantages of buying materials from our stores is the accessibility of experienced professionals to perform the proper vinyl flooring installation for you. We employ installation experts and guarantee that your flooring is installed properly. If you have any problems with your new vinyl tile or vinyl plank flooring for its lifetime, our professionals will come to your location and correct any issue. Contact us today to learn more about vinyl flooring styles available in our showroom. We proudly serve the communities of Johnstown, Somerset, Latrobe, Derry, Greensburg, PA, and the surrounding areas.